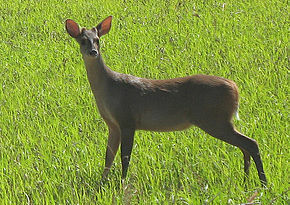 Red Brocket deer have a chestnut-coloured fur and a darker tuft of hair on their head. Males have short, straight, (not branched) antlers. Red brocket deer can be seen up to 2000m above sea-level. Often the solitary animals can also be found in the thick vegetation of the humid forests. They are diurnal or sometimes active during the dawn. They feed on fruit and mushrooms.